In addition to various things I'm supposed to do, I race triathlons. One of the training tools we use is the interval workout, in which we alternate high- and low-intensity time intervals during the course of a run or bike workout. There's been a bit of discussion during the Monday-Night run recently about whether it might be advantageous to train with randomized intervals instead of with set intervals. Typical sports-watches have an interval feature that helps time regular intervals, but they don't do random intervals. 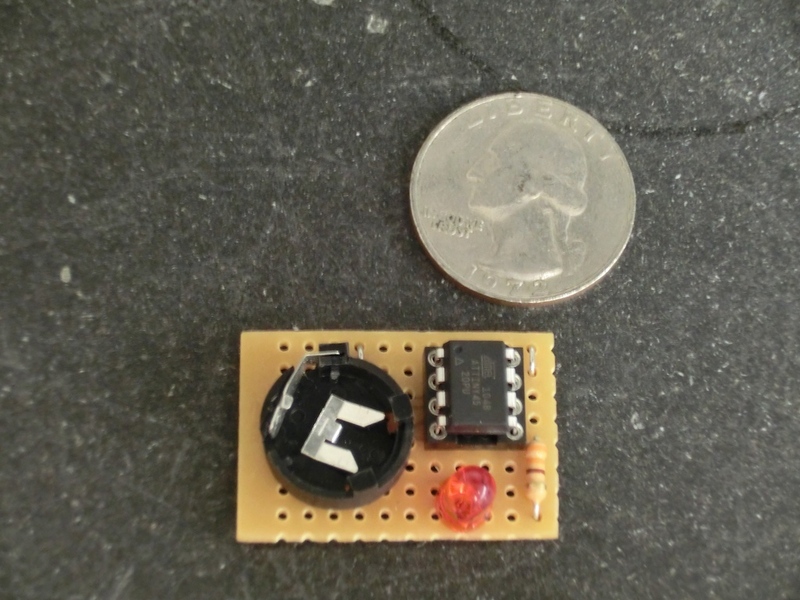 Here's my solution: use an ATtiny45 to generate the random intervals, and indicate the intervals via a flashing LED. Programming of the ATtiny45 was done via the Arduino IDE: the fuses on the ATtiny45 are set to use the 1MHz internal oscillator. The circuit itself is simply power and ground to the chip (using a 1225 lithium battery) and an LED with current-limiting resistor on PB0 of the microcontroller.